The Ingmar Bergman Archives consist of the donation of Mr. Bergman’s personal archives, covering 65 years of artistic creation in the fields of cinema, theatre, opera, radio, television and literature. The archive items include manuscripts, typescripts with personal annotations in handwriting, photographs, biographica along with private and professional correspondence. Ingmar Bergman’s personal copyright forms a part of the donation. To protect and preserve the unique and sensitive manuscripts the digitization of around 50 000 pages have been made in cooperation with the Royal Library in Stockholm. The digitized manuscript collections are accessible for study at research stations in the Swedish Film Institute Library. The online catalogue contains records for manuscripts, documents and photographs relating to Ingmar Bergman’s productions and his literary texts. Runs a search for information contained in the Document Name and Comments fields. Select this option by clicking in the search button at the top of the page. Verk (Performing Arts Titles) contains the original titles for theatrical pieces, operas, radio dramas, television dramas and feature-length films, as well as the non-Swedish titles of films. Runs a search for any references in both writings and correspondence. All correspondence included in the database is classified according to Ingmar Bergman as the sender or recipient. When the correspondence has been written by someone other than Bergman, his name is included in brackets [Bergman, Ingmar]. Ingmar Bergman’s donation prompted Stiftelsen Svenska Filminstitutet, Kungliga Dramatiska Teatern AB, AB Svensk Filmindustri and Sveriges Television AB to jointly establish the Ingmar Bergman Foundation in 2002. 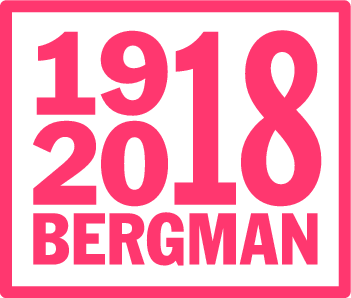 UNESCO has certified the inscription of The Ingmar Bergman Archives, The Ingmar Bergman Foundation, on the Memory of the World Register in 2007. The Register comprises archives and documents considered valuable to all humanity. Who has access to the archives? In accordance with the deed of donation, the collections are only to be made available to qualified individuals and to recognized writers for advanced academic research. The collections are only accessible for research or study after an individual application has been approved by the Board of the Ingmar Bergman Foundation. Archive materials may then be studied in the Swedish Film Institute's library. No materials or copies may leave the library. Other provisions are apparent from the application. 2018 marks the 100-year anniversary of Ingmar Bergman's birth. The Jubilee is already underway across the globe.